Bangladesh Prime Minister Sheikh Hasina on Monday spoke at India Foundation Awareness programme in Delhi. Speaking at the event, Hasina said that we have amicably settled Land boundary and Maritime boundary. 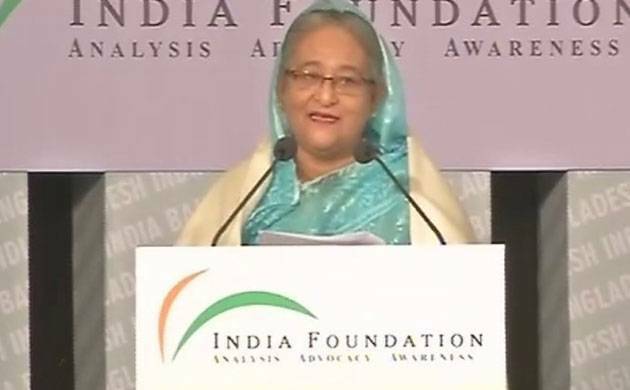 Bangladesh Prime Minister Sheikh Hasina on Monday spoke at India Foundation Awareness programme in Delhi. Speaking at the event, Hasina said that people of India and the Indian government supported Bangladesh wholeheartedly during the war of liberation in 1971. She said that India and Bangladesh have amicably settled Land boundary and Maritime boundary. Bangladesh PM informed that Bangladesh Parliament recently adopted a unanimous resolution declaring March 25 as Genocide day in remembrance of Pakistan atrocities. Hasina said that Bangladesh want this genocide to be recognised by the International community and PM Modi has made a commitment to remain with us in our efforts. Speaking on Teesta issue, Hasina said that PM Modi once again reiterated his government's strong resolve to conclude the water sharing treaty at the soonest and once it happens, the face of Indo-Bangladesh relations would undergo another transformation. Bangladesh PM informed that they strongly believe our common water resources must act as a uniting force and comprehensive, basin wide solution with in-built solution to water sharing of all common rivers holds key to common future. Sheikh Hasina told that India and Bangladesh have comprehensively addressed India's security concerns, this has been a factor in trust building and our journey towards peace and prosperity is put to peril by the rise of terrorism and violent extremism.